As an interior designer specializing in Rustic Interior Design in Dallas, TX I’m often asked about the first steps in designing a new home. It can be a challenge for some, but with proper guidance and some pro tips it should be an enjoyable experience. Buying or building a rustic home is the fulfillment of a lifelong dream. You’ve made it thru construction, or the buying process, and now you need to focus on the furnishings and design for your new home. Creating a cohesive design plan takes thoughtful consideration and diligent planning. Sometimes it’s an overwhelming task, but try to remember it’s supposed to be enjoyable. Don’t treat it like a job; treat it like a hobby and you’ll have more fun with the process. Scale – This is an important aspect of your design, regardless of the stylistic direction you choose. Sofas, chairs, tables and related accessory pieces need to be the proper size for your space. While something too large can overpower a smaller room, a piece that’s too small can be dwarfed by a larger space. Pick things that fit, and don’t make exceptions for any reason. A table that’s too big will always be too big, no matter how good a deal it was. Leftovers – These are the pieces that are literally leftover from a redesign of your previous home, and they should be avoided if possible. It’s an interior design mistake to take your 20 year old sofa from a previous house and place it in your new rustic home. We all have budgets, and they’re confining for everyone. But please remember this; just because you have leftover furniture doesn’t mean you should use it. If you absolutely have to re-use a piece that isn’t perfect, write yourself a note that it must be replaced in 12 months or less. Time and again we see couples who take a not-so-perfect sofa to the cabin with every intention of replacing it. Instead, their eye becomes accustomed to the piece and it ends up living there forever. Don’t fall into this trap; it’s hard to crawl out of! Collections – In our opinion, one of the hallmarks of good rustic design is the presence of collections in the finished plan. Think of something you like, or have always wanted to like, and start collecting that thing. Whether its antique fishing reels or vintage Navajo rugs or vintage maps, almost any item is more impactful when displayed as a group. Keep your collecting appropriate to the style of house rather than your personal taste or style. For example; if you have a log home on a lake in Colorado, a collection of vintage fly-fishing rods would be more appropriate than your collection of vintage dolls. Also, be careful not to over-collect or you’ll end up with clutter; three good things can be a collection. Remember; find something you like that fits with your style and buy the best examples you can afford. Timing – If you’ll be ordering rustic furniture you should allow 8 to 12 weeks lead time with better manufacturers. You can wait for your new home to be complete before ordering furniture, but if you’re able to make some decisions earlier in the process you’ll have better timing when you’re ready to move in. 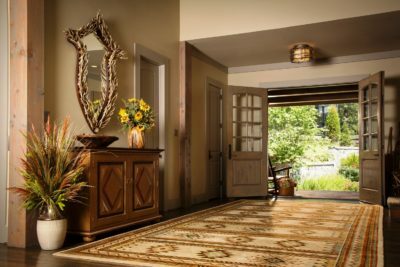 Quality – This is also an important aspect when designing an enduring interior space for your rustic home. We want to see clients invest in pieces that will last a lifetime or longer. People often make the mistake of buying a lower quality sofa, only to replace it in three years with another inferior sofa, and another replacement three years after that. If they’d bought a good sofa to begin with they’d have it for a minimum of 15 or 20 years and would never have had a headache and cost of replacement. Also, it’s ok to pull back in some areas and splurge in others. A good way to think about quality is to separate it into three categories; good, better and best. Your living room can have a good coffee table, better chairs and best sofa. Your dining room can have a good rug, good table, better chairs and a best chandelier. Blending all three categories will help you stretch your budget and ensure you’re spending money in the most impactful places. Layers – Don’t miss the opportunity to add dimension to your rooms by incorporating layers and textures. It can be as simple as putting a lamp on a stack of books instead of putting it directly on the table. Or, using a Navajo rug on the wall as art instead of a painting. What you’re doing is creating interest in your space and giving your eye another detail to absorb. Layers and textures are keys to designing a space with personality and depth. 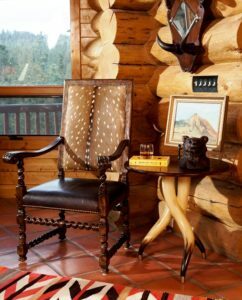 Designers – The cost of a rustic interior designer should be weighed against the value they provide. Interior designers can give you access at retail stores to discounts you never knew existed and can provide access to showrooms that aren’t open to the public. Generally speaking, money spent on an interior designer is a good investment and they can pay for themselves many times over. An interior designer will help you make decisions, clarify thoughts and improve your personal style. 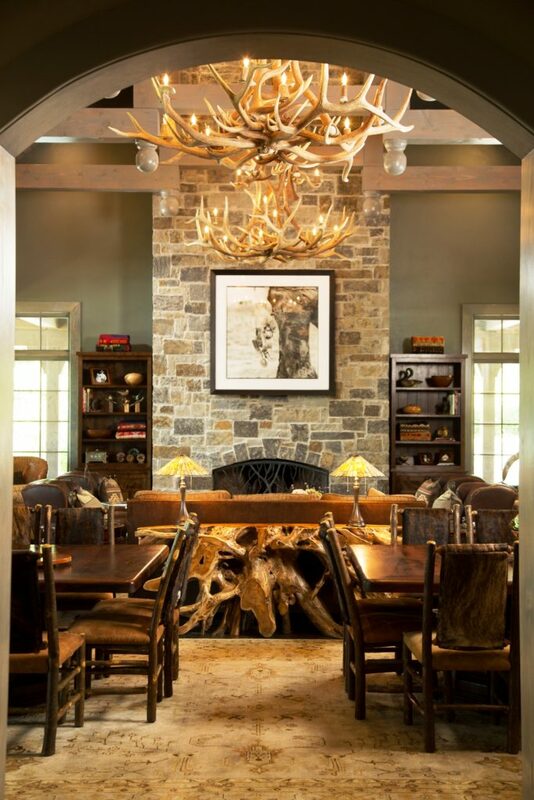 But just as important, a good rustic designer can help you avoid costly mistakes with furnishings and overall design.